I had cause to visit the post office in the Bledisloe Building in the city a few days ago -- and realised, from this view, how things had changed over time. Even since the 1980s, when I first worked in the central city. 16 October 1927. "Looking south west from Queen Street showing Old Market Square (foreground), Elliott Street now Bledisloe Street (left to right across centre), premises of (from far left) Northern Automobiles Limited, Graham Brothers, Frank Grayson, signwriter, E Gates, bootmaker, Brooking and Sons, bookseller, a sign advertising Kaiapoi Woollens, Wellesley Street West and Foresters Building, on the corner of Albert and Wellesely Street (far right)." Ref. 4-5644, Sir George Grey Special Collections, Auckland Libraries. The site, just to the north-west of that of the old Market Building, was a collection of retail shops in the 1920s along Bledisloe Street (the southern extension of Elliott Street), off Wellesley Street. In front by that stage was the carpark left behind by the clearance not only of the Market Building, but also other Council-owned buildings leased for retail purposes. Those were the days of mayoral dreams of fancy civic centres, soon gone to nought. The Civic Theatre itself didn't exist. But in the late 1950s, the landscape changed. 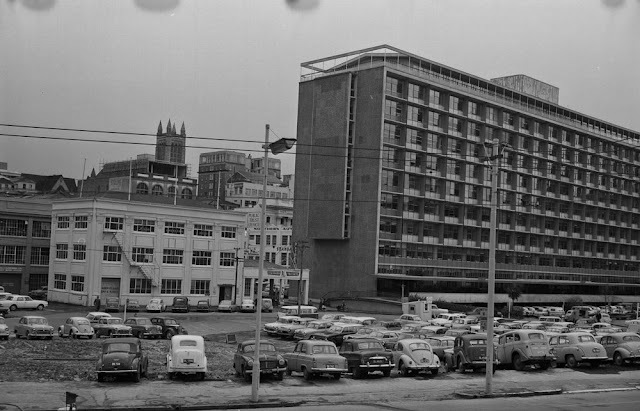 Plans for a combined local and central government administration centre at what is now Aotea Square began in earnest in 1946. Central Government, in the form of the Ministry of Works, was able to get into gear just a bit quicker than Auckland City Council. 13 August 1964. Bledisloe Building to the right. Note the three-storey building to the left, which can also be seen in the image further up -- a measure of how the new building filled up the frontage. The the-storey building was demolished, perhaps during the Aotea Centre development in the 1970s-1980s. Ref. 580-10668, Sir George Grey Special Collections, Auckland Libraries. Designed by Francis Gordon Wilson (1900-1959) with Douglas Jocelyn "Jock" Beere (1913-2001), the 11-storey Bledisloe State Building (to use its full name) was completed in 1959 and occupied by government staff from March that year. The name was chosen as the result of a competition by school children. At the Wellesley Street end, the Maori anchor sculptures were installed. I think from the 1990s, after the second-to-last big municipal amalgamations, Auckland City Council departments started to use part of the building as offices, an overflow from the tall Civic Building on the other side of the Aotea Centre. But what started me thinking about the building was this -- metal letters now removed from the side of the entrance to the post office. Oh, sorry -- the Post Shop. For yes, this is what has happened: the Wellesley Post Office, often the reason why I'd visit the building, even now, is just a Post Shop now. Although the large postbox lobby is fairly well the same. While the red signs are great to spot from a distance -- I do miss the metal letters. I'm a bit of a traditionalist, that way.